Parishad, Allahabad, in Indian Classical, Adhunik and Bhajans. Professor, Rabindra Bharati University, Kolkata . Banasree Sengupta at Music World, Kolkata . choreographed for TV channels ferlike Fortune Channel, Akash Bangla Channel. 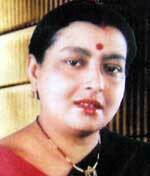 as Banasree Sengupta, Sreeradha Bandopadhyay, Arundhati Homchowdhury, Srikanta Acharya and others. 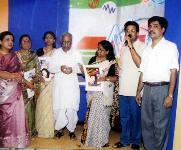 She has also been participating in the Sangeet Mela programs. 14C, Subodh Park, Bansdroni, Kolkata 700070. Tel: 91 33 24210075. Mob: 9330029484. Agnibha Bandopadhyay During the release of her album Keno Swopno dekhale(right). Professor, Rabindra Bharati University .